Market timing is not a science but after investing for 40 years I have come to realize that market timing has credibility and through studying various market timing systems and market timing indicators I have developed a strategy of using market timing to keep my portfolio on the right side of market direction. Whereas there is truth that no amount of market timing or market timing systems can be accurate 100 percent of the time or even 50% of the time, I have found that for my portfolio to benefit my market timing indicators do not have to be right more than 50% of the time. What is important for my portfolio is for it not to get heavily invested when the overall market direction is about to turn down. In other words when the market direction is heading lower, it is time for caution and to raise cash levels. Therefore if my market timing indicators warn me that the market direction may change, I pull back and raise cash levels just to be on the safe side. This system of applying my market timing indicators and remaining cautious during market pullbacks has assisted my investing to the point that over the past 35 years I have never had a negative year. While it is true that in some years the market has shot up tremendously and I have not earned as much as the overall market, in the end it works to my favor to be cautious as on average I am up far beyond what the S&P 500 has been able to provide investors simply because I miss so many of the big crashes. For me then, market timing is not about predicting how high or low the market may go. It is not about predicting exactly where a crash or collapse may occur. Instead it is about using market timing technical indicators to warn me when to stay cautious and when to raise larger amounts of cash. It is true that I am always investing in the stock market but through market timing I have been able to keep my trades on the “right side” of market direction and therefore I have benefited from both bull and bear markets. Market Timing for me is not about pinpointing market direction changes. It is about being on the right side of market direction and profiting in either bull or bear markets. 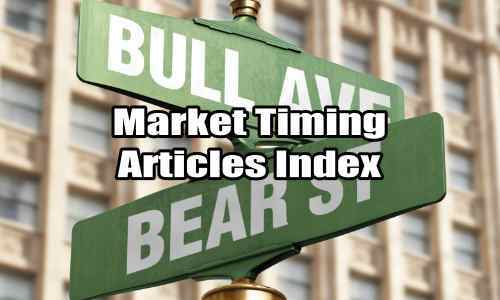 Here is a list of articles that can assist investors in setting up their own market timing systems or methods for profit and income. June 2 2018: The market timing system I use based on the unemployment report is warning of higher volatility ahead for stocks. Staying protected is advised by this market timing system. May 4 2018: Following the release of the unemployment numbers for April 2018, the market timing system I use is advising that June will see another interest rate hike. Investors should be prepared for some market weakness and gyrations. Oct 5 2017: A review of the Weekly Initial Unemployment Insurance Claims and how it reflects on the market timing system that uses the unemployment reports to determine when to enter and exit the stock markets. May 12 2016 – Every Thursday the Labor Department issues the Weekly Initial Unemployment Insurance Claims. After almost a year of declining numbers, today’s report shows the third weekly increase in claims. With weekly claims nearing 300,000 here is what this market timing system advised investors to consider. Feb 27, 2014 – The Weekly Initial Unemployment Insurance Claims are perhaps one of the best market timing systems I have available. Here is the method I use based on the signals received from the Weekly Initial Unemployment Insurance Claims every Thursday which helps guide which strategies should be used and when. Jul 07, 2013 – Investors continually find their portfolios damaged and experience large losses by entering the stock market at the wrong time. Market timing is not the easiest thing to do but this strategy is one I have used since the early 1970’s to advise me when to get my capital back into the stock market and when I should stay out of the market or take my profits. Jun 13, 2012 – There are three levels of market timing, longer-term, long-term, mid-term and short-term. Every night I put up my short-term outlook which I follow consistently in order to profit from the market direction. In this article I discuss how I use market timing indicators to keep me on the right side of the market and how I combine all the various market-timing levels in order to stay profitable and stay invested even during the worst market conditions. Nov 05, 2011 – Even for the skeptics this article is worth reading as it lays out what is meant by the term Market Timing and how every investor should consider using it in their day-to-day investing and trading. This is a great place to start for gaining an understanding of market timing in general. Mar 13, 2012 – This article looks at how I use market timing and why after so many years of investing I have come to believe in it. Dec 13, 2011 – I have found that investors either believe in market timing or they don’t. This article makes the case that it is not worth the effort to continue to debate the merits of market timing when it comes to investing. Instead consider a number of strategy that might assist an investor’s desire to grow his capital. Oct 24, 2011 – Regular readers know that selling options, in particular selling naked puts, is my favorite strategy for profit and income. In this article I discuss the important role that market timing plays when it comes to selling options. Dec 10, 2011 – In this article I look at the steps investors can take to decide which of the market timing technical indicators they should consider using for their stocks and their style of investing. Apr 15, 2012 – There are literally dozens of market timing systems in use today. Everything from candlesticks to planet alignments and the ocean’s tides. The Ultimate Oscillator is an excellent market timing system. Jun 02, 2012 – Another simple yet uncannily accurate market timing system is using the commodity laden Toronto Stock Exchange to predict market downturns. Apr 12, 2012 – MACD (Moving Average Convergence / Divergence) Histogram is another market timing system used by thousands of investors. In this article I look at how good a technical tool it is for timing when to get in and get out of the stock market. Jul 07, 2012 – Probably one of the best market timing system methods I have encountered to date. Nothing is foolproof but this system has kept me in and out of the trouble for years. It is excellent at advising when to stay long in the market and keep committing capital to more positions including naked puts and when to turn my capital towards bear ETFs and Ultra Short ETFs. Excellent is just about every way I can think of I follow this system every Thursday when the Weekly Initial Unemployment Insurance Claims reports are released. Dec 30, 2012 – Another great system which I have found incredibly profitable is trading the VIX Index call options against the market direction. This market timing system has many benefits including profiting from market gyrations. Mar 20, 2014 – The Weekly Initial Unemployment Insurance Claims remains one of the better market timing systems. It has a long track record of proven performance. With the market direction stuck near all-time highs many investors must wonder if this market timing system can continue to provide the guidance to stay invested safely. June 19, 2014 – The latest update in perhaps one of the better market timing systems developed using the Weekly Initial Unemployment Insurance Claims. Select this market timing link to read Wikipedia’s take on market timing.